CSIL researchers and partners will attend the 57th edition of Salone del Mobile fair, international design and furnishing event to be held in Fiera Rho-Milan on April 17-22, an opportunity to meet furniture professionals and to exchange information, news, feelings on the furniture market. The 16th Edition of CSIL International Seminar ‘World Furniture Outlook’ will take place at Fiera Milano-Rho Congress Centre, during the fair, on April 18th, h 11.00 - 12.30. CSIL experts will introduce their forecasts concerning the furniture sector worldwide and will comment on the main factors affecting production, consumption and trade of furniture on a global scale. CSIL findings will be discussed with selected institutional representatives as keynote speakers, focusing on internationalization strategies operated in the global market. ‘Furniture distribution in Europe’ (February 2018), a comparative analysis of the home furniture distribution system in 13 European countries aiming to provide information on main structural changes affecting the sector, evolution of furniture distribution channels, country peculiarities, strategies, policies and leading furniture retailers. "Sofa market in Europe" NEW 30 countries edition. In-depth analysis of the upholstered furniture market in Europe. "The European market for office furniture", covering 30 countries, a detailed picture of the office furniture industry in Europe. 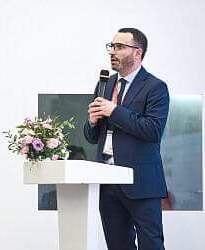 Mauro Spinelli, CSIL partner and senior expert in the research field of office furniture, delivered a speech focusing on “Trends in the European office furniture market: the dealer's point of view" at the 9th edition of the Global Office Furniture Outlook in Guangzhou, a Forum organized by CIFF and Edimotion, where international professionals and journalists of the office furniture sector debated matters regarding the workplaces environments and trends.